-Engo beat him down pretty nice. -Rangers generating the first attack. -Talbot with a point blank shot but shoots it right at Lundqvist. Yet another missed opportunity from Max. -Conner in the box. This penalty kill is indescribably important for the Pens. -Callahan with a golden opportunity to make it 2-0 on the PP but just missed an open net. Pens surviving so far. -I'll say it now (midway through period). Things better change in a hurry. 1-0 Rangers and the Pens with only 1 decent scoring chance so far in the game. -Kunitz out with Adams and Godard for a shift. Probably the best of the game so far for Pittsburgh. -Fleury looks pretty sharp but having trouble with rebounds so far tonight. -Delay of game on Pens. Another huge penalty kill coming up. -Solid aggressive penalty kill for the Pens. 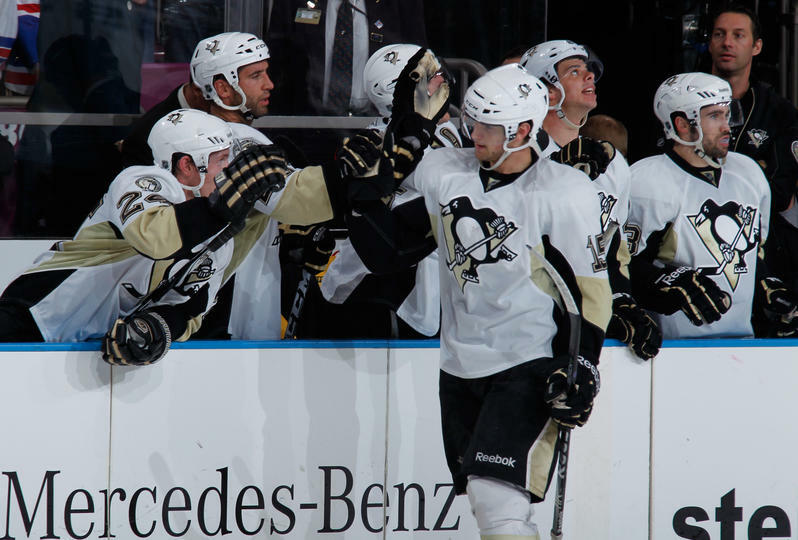 Notes: Pens did gradually improve as the period went on but not all that much. The defense got better, but the offense has yet to do anything since Talbot's chance. Pens need to start getting pucks deep...blah blah blah the usual stuff you would say to a team doing nothing offensively. -Puck drops. Cooke and Prust yapping but no fight. Meanwhile, the Rangers come very close to scoring after Fleury mishandles one behind the net. 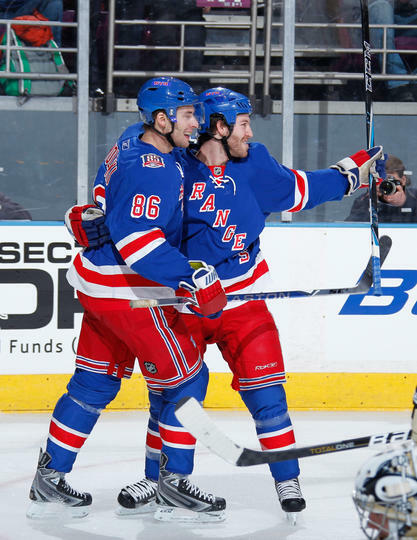 -Stepan point blank in front of the net. Fleury needs to snow-angel to stop it. Why did the D just let him in there like that? -Fleury again gives up a rebound, but seems like he is going to get away with it until Anismov bats it out of the air. 2-0 Rags. -Versus reporting Asham is hurt. -Engelland puts a nice beating on Prust. I guess anything counts as momentum. -Dustin with an absolute cannon from the left circle. What a timely goal! And on the powerplay too... 2-1 Rags. -Staal with a huge defensive play in front of the net to intercept a back-door pass. May have saved a goal. -Conner blocked a hard shot. Got up slowly and headed down the runway. -Prust with a nasty hit from behind on Kennedy. Staal jumps in and engages Prust. Throws a gloved punch, 5 minute match penalty. Ugly situation here. He is gone. -3-3 at the end of the period. Notes: Unbelievable how things change. The Pens had taken complete control of the game and were completely outworking the Rangers until the Staal penalty completely turned everything around. Pens now have to finish the game with 9 forwards (assuming that more don't get hurt). -When it rains it pours. Michalek swats the puck in the direction of the glass and it sails over the net. Rangers with another PP. -Fleury with a huge save on Zuccarello to keep the game tied. -Dubinsky takes a slash. 4 on 4. -Fleury making more big saves. Pens starting to feel the fatigue from the short bench. -Avery runs into Fleury. No call. -Conner is back out and playing so that is one bullet dodged tonight. -Fleury with another big save on Avery. -Pens are starting to gain the edge in possession time, but still not on the scoreboard. -Letang takes a costly penalty with 7:14 to go. PK needs to dig deep without Staal. -Taken care of business on the PK. Now it's a 5 minute showdown for the game (and then maybe another if this one doesn't settle it). -2 minutes to go. Pens being outshot 11-1. -Pens take an icing penalty with 40 seconds to go. Already used their timeout so this could be dangerous. Notes: We can thank Fleury for that point. That was a Ranger period everywhere except the scoreboard. Time for some bonus hockey. -2 on 1 for Anismov and Gaborik but Goligoski and Martin do a fine job defensively to break it up. -4 minutes of Rangers attack. 4 minutes of Fleury saves. It's shootout time, folks. -If Bruce Boudreau were here, he'd say something about overcoming adversity. -Dustin Jeffrey had been playing quite well before in his stints with Pittsburgh, but to put a performance like that in a game like this on national TV...welcome to the NHL bro. -Huge props to the penalty killers (as usual). Kept it close when it was needed most. -Talbot continues to be "snake-bitten" Can't buy a goal. -I'm not going to further comment on the Staal situation other than this. Yes he was in the wrong for throwing the punch. Yes Prust clearly embellished it a lot. It's the NHL's call about the suspension. -But that leads into my next point of expecting some callups because Asham also left the game. Not sure about the severity of Letestu's injury and the word is that Malkin will be returning soon, but better safe than sorry. What a huge win tonight, morally and mathematically. Picked up 2 big points on the Flyers (who got hammered by Tampa) and also (obviously!) one on the Rags.